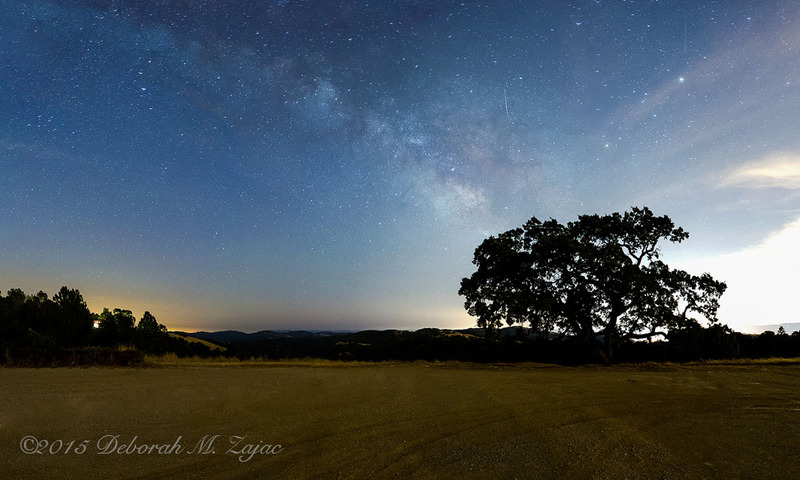 In 2012 I shot my very first Milky Way Pano. I’ve not yet posted it…it is still a work in progress. Since then I’ve been wanting to improve on the techniques I used in 2012 which was…I won’t lie, ” flying by the seat of my pants”. One of the things I want to improve is getting better stitching. Even using a tripod, and generous overlapping I wasn’t happy with the stitching. I hoped that by calibrating my lens to find the Nodal Point, or No Parallax Point I would get better stitching results. What is the Nodal Point and why does it matter you ask? Do this. Hold up your thumb or pen in front of your face at arm’s length, and move your head from left to right. Notice how the background moved on one side more than the other? That’s Parallax. If you were to take two images one from the left and one from the right side and merge them the line would not be straight. You need to either have the point of view of the pen or the background. Yesterday afternoon I figured out the Nodal Point, or No Parallax Point for my 24mm f/2.8 lens. I mounted my camera on my macro rail, and a tripod. Making sure that tripod was level, next making sure my camera/macro rail were level, then I lined my tripod rig up with a light stand placed a few feet away from the tripod, and a pole I have in the backyard which is further away from the light stand. Loosening my panning knob on the ball-head I moved the camera/micro rail left and right and could see the furthest pole on both sides of the light stand I had parallax. Then I moved my camera back to the center point moved my camera back using the macro rail adjustment knob. I locked it down and moved my camera right and left again…the parallax got worse telling me I needed to make my adjustment on the rail in the other direction. I loosened the rail and moved the other direction a bit then moved the camera from left to right, and saw I was getting there; I only saw a little bit of the further pole behind the light stand now. One more small adjustment and Voila! I didn’t see the further pole behind the light stand when panning the camera left and right. I found the Nodal Point, or No Parallax Point of that lens! My rail has centimeter, and millimeter marks so I made a note of the number that 24mm f/2.8 lines up with to be able to quickly set up a panorama shot with that lens again. Now that I had found the Nodal/No Parallax Point I was anxious to test it out. The sky was supposed to be clear so I met a friend at a favorite Night Sky spot to shoot the Milky Way. My goal was to make a Vertorama/Panorama using my new measurement of the Nodal Point. The clouds moved in and when they hit the city lights below they really lit up! I’ve cropped off a bit from that right side. It was a fairly early night due to the clouds. It’s important to note that each lens has its own Nodal/ No Parallax Point! Prime lenses are easier to figure out because you only need to make one measurement, but if you’re using a Zoom lens you’ll need to figure out the Nodal/No Parallax Point for each focal length you’ll use. For example, I use my 17-35mm AF-S Nikkor wide-angle lens a lot so I’ll be spending some time this afternoon finding the Nodal/No Parallax Point for that lens at 17mm, 20mm, 24mm, and 35mm. I’ll also find the Nodal/No Parallax Point for my 16mm fisheye lens. I’ll write down each measurement for each lens on my cell phone’s notepad, along with which camera was used, and I’ll upload that information to my computer so I have it there as a back-up as well. Initial development of the images was done using LR5. Then I stitched this image in Photoshop CS6. Due to the light variation I had some seams showing. I clicked on each layer and using the clone brush fixed those. All in all I think a very successful endeavor. I hope next week-end has a clear night so I can get out and do this again. This is absolutely stunning! I’m sorry I’ve been so behind in reading blogs. Do you sell your work, Deborah? Thank you so much Melissa! Life takes priority and we all get behind with those we follow from time to time. I’m thrilled that you took the time to look through some of my recent posts! this is such a cool shot, Deborah! Thank you so much Hui! beautiful work Deborah!! I love it!! Thanks do much for the explanation Deborah. I think I understand this. I look forward to seeing the finished product. That’s so awesome! Thanks much for the tutorial. I’ve been meaning to learn how to calculate nodal point etc and even booked marked instructions from the Internet, but just never got around to it. As you know, I’m preparing to hike and explore Mt Baker and Mt Rainier. Both destinations offer spectacular pano opportunities. Thanks Geo! It’s really easy to set up, and a little work to get find the Nodal Point. I hope you’ll be able to figure out your lenses NP before your trip. You’re going to have some epic views, and trip!